Because females invest so much more energy into reproduction than males do, females are high-energy resources and hence very valuable to males. Consequently males are likely to evolve strategies to compete for them. Sexual selection means that any physical trait or behavioral pattern that increases access to mates will be evolutionarily advantageous. Sexual selection is most pronounced in polygamous species, where a sort of winner-take-all system results in clear winners and losers. One of the most common competitive strategies for males involves physical size and strength. Across many, many species larger males have more offspring. Likewise dominant males can jealously guard access to multiple females, creating harems that they defend aggressively. However, in these circumstances non-dominant males will be excluded from access to females. Therefore, the non-dominant males have developed alternative strategies. In several species, including stickleback fish, prairie chickens, and elephant seals, smaller and non-dominant males disguise themselves as females to gain access to the dominant males’ territory and the females within. These strategies work in direct male-to-male competition. But females are also often highly selective. Males have to compete for female favor as well. It is likely elaborate display rituals that are evident in many birds reflect behaviors evolved to enhance female preference. Such rituals often do two things. They can advertise the males’ size and strength, often in exaggerated form. They can also attempt to persuade the female of the resources the male can make available for child rearing. For example, male scorpion flies give a high calorie gift to their prospective mates. Female scorpion flies, in turn, prefer males who make larger gifts. Perhaps the tendency for human males to buy women expensive jewelry and take them out to high-priced restaurants is a related phenomenon. In the competition for sexual partners, many species have adapted in amazing biological and behavioral ways. 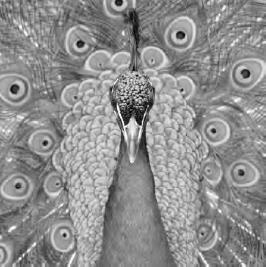 Peacocks, for instance, have evolved so that they have stunning feathers to attract peahens. Humans, too, have developed their own competitive strategies (iStock).